Rockstar NY Proves to be "Eye of Sauron"
The recently criticized Rockstar NY office has released a few wallpapers that prove it is the root of all evil. Trouble in Rockstar Games' paradise was stirred up last week when the wives of Rockstar San Diego employees wrote a plea requesting better working conditions for their spouses. This led to lots of insider information coming from various sources concerning Rockstar New York's management style, eventually eliciting a response from Rockstar New York itself. One of those insiders said Rockstar NY was similar to the "Eye of Sauron" on MTV Multiplayer, comparing the company to the portal through which the Lord of the Rings's supreme evil watches over Middle Earth. Rockstar NY appears to have responded directly to this comment with a new wallpaper set released on its website. 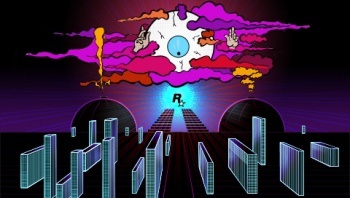 The set of three wallpapers is called "The Eye," and all feature a giant eyeball with arms floating in multi-colored clouds while keeping a close watch on the Rockstar logo. One shows a somewhat angered eye with lightning bolt in hand seemingly about to pounce, while another has the eye just inches from piercing the logo with a bolt. All three can be found on Rockstar's downloads page. These would be pretty good wallpapers if the situation they were created under was humorous at all. Rockstar NY could be trying to lighten up the mood by putting a funny spin on things, but at the same time is making fun of its employees. Either that, or one of the artists over there came up with something funny and they ran with it. With so many anonymous sources criticizing the company, there's got to be something wrong at Rockstar, but only those that work there know for sure. Should we be gathering a fellowship to take Rockstar NY down?